As we move toward release this month, the United States is reeling from the recent school shooting in Parkland, Florida and China is recovering from a brutal knife attack in a Kunming railway station. 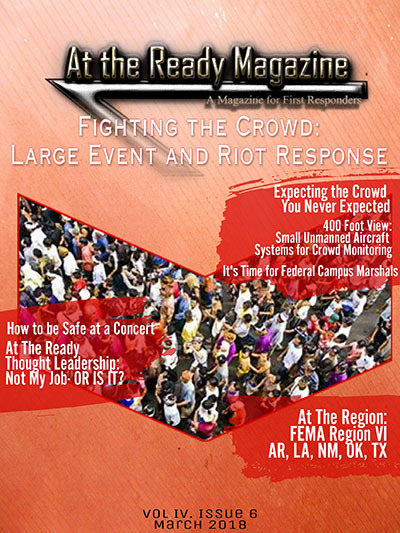 When we planned this issue last year, we were looking to cover the crowd/riot response and large-scale event security. Recent events have shown that sometimes the crowd isn’t in the offense, but the defense. After a large-scale attack where many people are affected, panic often sets in and crowd management takes on a different role. Within that pandemonium, responders triage, calm and reassure the crowd, preserve evidence, and minimize the misinformation running with the press. It’s no small task. While it is quite unusual for us, we decided to add to this issue. The first addition was first printed here in 2015, and Op-Ed from Jim Sharp, It's Time For Federal Campus Marshals . The second is the link to a new, free, online mass casualty triage course available from National Disaster Life Support Foundation. We bring personal safety to the forefront this month with Brian Duff’s How to Be Safe at a Concert. For the crowd that IS in “the offense” we have articles from Riley Land The 400 ft View: Small Unmanned Aircraft Systems for Crowd Monitoring. Riley’s agency spent years preparing for and monitoring large crowds that came for an annual demonstration of a military training school in Columbus, Georgia. Jim Sharp offers, Expecting the Crowd You Weren’t Expecting. Jim lives and works front and center near the Ferguson, MO riots from a few years ago. Of course no issue would be complete without our regular features. Chief Avsec has a question for all who serve in the fire service, It’s Not My Job: OR IS IT? And this month’s At the Region field education and reciprocity resource has the latest updates for FEMA Region VI: Arkansas, Louisiana, Oklahoma, New Mexico, and Texas. Enjoy the change in seasons. As the snow melts, prepare your department for the coming season of concerts, road races, and community events that tend to coincide with spring. Feel free to drop us a line anytime at mailbag@atthereadymag.com. We welcome all comments, good, bad, and ugly, as well as suggestion for future issues and other feedback. We are here to help you stay At the Ready.